I picked my top four favourite highlighters from my collection to bring you battle of the highlighters. Why you ask? Why not is my answer. I wanted to talk about them a little more in depth to possibly help those of you in the market to purchase a new one (or first, yay!). First up, we have a pressed shimmering skin perfector by Becca, in the shade Opal. It is described as "ultrafine luminescent pearls that absorb, reflect, and refract light so your natural radiance is never lost." This powder is indeed ultrafine, and loaded with shimmer - not to be confused with glitter. I especially love this one in the summer when I have more of a tan. I find in the winter months that it is almost too dark for my complexion, giving my skin an almost muddy appearance. However, when I have more colour to my skin, this is the one I gravitate towards. It lasts for at least 8 hours, and gives the strong highlighted look that I love. 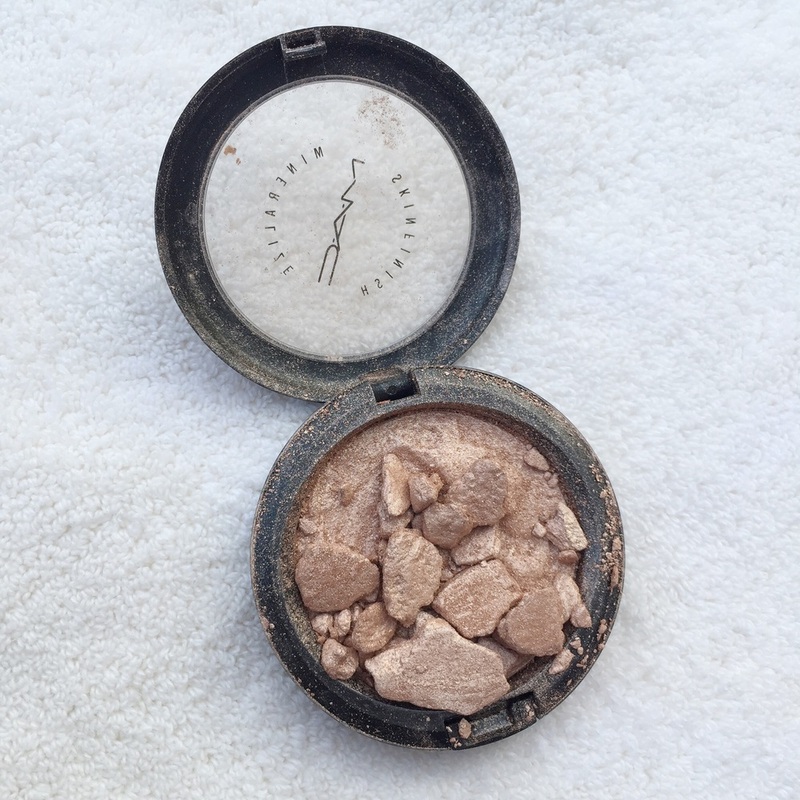 Next in the lineup, we have a mineralize skinfinish by MAC in the shade soft and gentle. This one is well-loved, as you can see from my photo below. It is described as "a luxorious power with 77-mineral complex that adds highlights to the face and body." This is one of MAC's best sellers, and for good reason. Soft and gentle is a neutral tan shade with a silver sheen, and can be worn with all skin tones. It is finely milled, but not quite as fine and smooth as Becca's shimmering skin perfectors. When applied with a light hand, this can give the most beautiful glow. I recommend this one to the girl who is just adventuring into the highlighting world and wants something that will pair well with any makeup look. Hot Sensation by MAC is next in the mix, which is part of their beauty powder range. This is described as a "sheer pale peach highlighter" , but I personally think it leans a lot more pink. On me, it has more of a brightening effect than it does a true highlighting effect. It is very finely milled, and soft without being powdery. I love this one when I'm wanting to create the Kim Kardashian style highlight. By that I mean adding more brightness instead of shimmer. Hot sensation might not be your pick if you have a darker skin tone, as it may look more ashy. This would be a perfect pick for the girl with a light to medium skin tone, or for someone who is concerned about fine lines. Sometimes, shimmer can settle into fine lines and actually make them appear more drastic than they actually are. If that is the case for you, stick to a highlight with less shimmer, like this one! Last but not last, a cult favourite. Albatross by NARS. This was one of my first purchases when initially diving into the beauty world, and I don't regret it! Albatross gives a sheer light golden sheen, and must be applied with a light hand unless you plan on being mistaken for a walking disco ball. I am all for a strong highlight, but not so much for glitter on the face. When applied properly with a fan brush, for example, this highlight can truly give you the most perfect sun kissed glow. Its golden undertones match well with warmer skin tones. Another way I like to use this is to layer over a blush to give an overall sheen to the face. This highlighter is perfect for someone who wants something versatile, or something that makes a statement. Below are swatches of the highlighters in natural light. I wish you the best of luck in your future highlighting endeavours!